We collect Personal Data that you voluntarily provide us, when you register for the StageMilk Newsletter, or sign up to StageMilk Drama School. Personal Data may contain your name, email, contact information, your location, as well as other information you provide to us. StageMilk collects billing information when processing payment on www.stageMilkdramaschool.com, and StageMilk Online Acting Training via Teachable. in conjunction with posting casting notices and subscribing for membership. We are not responsible for the privacy policies on Teachable. You should be aware that the privacy policies of Teachable.com may differ from our own. StageMilk collects and stores data about you when you use StageMilk’s commenting platform to communicate with us, and other users. We love hearing your feedback! Some of our content (www.stagemilkdramaschool.com) is protected by a username and password. Whether a username and password is generated by our website, or created by you, these will almost always be connected with some other information related to or connected with you. Usernames and passwords, are kept private and not disclosed with any third parties. We may access this information to help provide you with the products or services for which you have paid and signed up for. 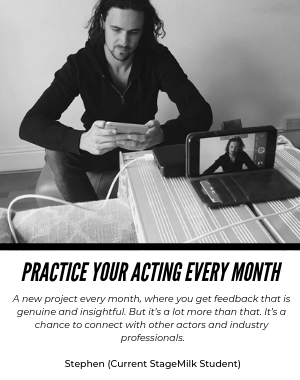 to send you updates about new posts on the blog, articles you might be interested in, events, our online courses, as well as general acting tips and advice. for internal business operation reasons, including the gathering of statistics. To target and measure the performance of advertisements displayed to our users directly by Backstage or through third party advertising partners, on and off StageMilk. Any information you supply us with, via email, Social Media or Blog comments will be kept confidential. Such information will not be disclosed, unless authorised by you or otherwise required by law. Our goal is to simply provide you with the information, and the resources you might need to begin your acting career, take your acting career to the next level, and become a better actor. If at any time you find our information not useful (highly unlikely) you may choose to unsubscribe and discontinue visiting our websites. Other information may be collected as well, which is rather typical of most websites. For instance, the source that referred you to our website is generally known. Likewise, your duration on our website. Other common data collected includes the type of operating system the computer you are using to access our website has. Similarly, the type of web browser is often noted. Again, this is common data collection, and helps ultimately produce a better end-user experience. You have the right not to provide or withdraw consent from StageMilk collecting your data at any time – keep in mind this may affect our ability to provide you with the products and services we offer. You also may have the right to access the Personal Data that you provided StageMilk, and you may have the right to the erasure of Personal Data that we hold about you. You have the right to request StageMilk to stop sending you marketing communications and you may have the right to require StageMilk to correct any of your Personal Data. And finally, the right to lodge a complaint with a supervisory authority if you feel the above conditions aren’t being met. If you have any questions or concerns, please do not hesitate to contact us: [email protected], we’re always happy to help.